The silicon transistor continues to be at the heart of post-PC era products like the smartphone, the tablet and the smartwatch. However, the success metrics for the transistor are quite different now than they have been in the past. Frequency (clock-speed) was the primary metric in the PC era and the standalone central processing unit (CPU) was the primary chip that drove advancements in semiconductor technology for decades. Form-factor was hardly an influencer and there wasn’t as much of a drive to integrate system-level functionality either on-chip (SoC) or in-package (SiP). Form-factor, cost and power-per-function are now critical drivers in the mobile market and that in turn has increased the importance of on-chip integration of functional hardware (e.g. power management, computing, audio/video, graphics, GPS and radio). This shift from mostly performance-centric chips to mostly power-constrained chips and the focus on lowering cost and increasing system-level integration has disrupted the traditional semiconductor landscape within just a decade and continues to reshape the industry today. SoC technology was used by fabless vendors and foundries long before the advent of mobile computing. But it is the rapid proliferation of mobile post-PC products that is proving to be the catalyst for this technology to finally realize its full disruptive potential. Within the last five years, SoC technology has moved from being at the heart of smartphones to enabling many tablets and full-feature mobile computers. This article describes the emerging importance of the SoC, its likely technological evolution and its potential impact on the semiconductor industry in a mobility driven age. In the post-PC world, the computing paradigm has shifted in such a way that overall user experience is now a critical benchmark independent of the raw performance of the underlying technology. The Apple iPhone and iPad are great examples of this paradigm shift. Even the early versions of the iPhone provided a highly satisfactory user experience — not because they featured the fastest computing speed with the most advanced silicon but because they enabled rich features at reasonable computing speed and reasonable price points. The silicon technology features of these devices collectively enhance the user experience — outstanding graphics rendering, wireless connectivity, instant-on, connected stand-by, long battery life and touch-screen apps. The earliest versions of the iPhone did not offer the fastest raw computer performance, but they were perceived by the average consumer to be fast and provided a far superior user experience. Over time, in line with classic disruption theory, the SoC transistor platform caught up to the incumbent CPU transistor platform to the point where now the Apple A9X SoC offers 64 bit desktop-class computing enabling a handheld tablet to go toe-to-toe with a state-of-the-art laptop CPU from Intel (See John Gruber here). The key to the success of early post-PC products like the iPad is the fact that they were designed from the ground-up without the baggage of legacy PC-era software (Mac OS) or hardware (x86 CPU). Innovation around the sustaining silicon hardware technology would have called for higher performance standalone processors (CPUs) utilizing the abundance of logic transistors and even more complex layers of software to utilize the abundance of memory capacity. Instead, the new products utilize highly power constrained hardware and very lean software for accomplishing specific tasks (e.g. a video decoder to drive the display). In order to make power-efficient systems for the mobile world, it is critical to shift as much of the burden on hardware while utilizing lean software. Simply force-fitting legacy PC hardware and software into a new form factor will not be as power efficient and hence will not lead to a superior user experience. Of course, the emergence of post-PC devices does not herald the end of the traditional PC as we have come to know it. Racks of servers will continue to be used in data centers for compute-intensive applications for the foreseeable future. Yet, if history were a guide, it would suggest that the sustaining CPU semiconductor technology underlying traditional PC products is likely to be eventually displaced or at least substantially altered by the disruptive SoC technology underlying the smartphone. The rapid evolution of SoC based technology over the last few years supports this hypothesis. Since the advent of independent foundries at the end of the 1980s and early 1990s, the semiconductor industry has been segmented into three major entities — Integrated Device Manufacturers (e.g. Intel, AMD (pre-2009) and Samsung), fabless companies (e.g. Apple, Qualcomm, Broadcom, Altera, NVIDIA) and foundries which make chips for the fabless companies (e.g. TSMC, UMC, Samsung, GlobalFoundries). Historically, Intel and AMD focused on making x86 architecture based CPU-based chips (e.g. Core and Athlon) while NVIDIA focused on making standalone graphics chips (GPU) for the PC and server markets. All the other players in this landscape have utilized some form of on-chip system integration (SoC) to meet the diverse needs of their respective markets. The generic definition of a SoC is the on-chip integration of a variety of functional hardware blocks to suit a specific product application. A SoC can thus be as simple as a basic connectivity chip which combines some mixed-signal and digital circuitry. A more complex SoC may include the on-chip integration of an application processor unit (APU) and a graphics processor unit (GPU). Even more functional SoCs further integrate various other hardware blocks (e.g. image processor, audio/video decoder and modem). It is this ability to continue to integrate disparate functionality on a chip that has enabled SoC technology to rapidly evolve from supporting a simple feature-phone to a smartphone and all the way to a tablet and a laptop. Qualcomm started out by designing chips for the growing connectivity market with the advent of cellular telephony and the internet. Nvidia came to light as a maker of standalone graphics chips. Over time, each of these companies responded to an evolving technology trend and built upon their initial successes as they incorporated ever higher levels of functional integration into their chips. Qualcomm evolved its product line-up from standalone connectivity chips by adding an applications processor (Krait via ARM license), a GPU (Adreno via AMD Imageon buyout) and a power management unit. Qualcomm’s flagship products (Snapdragon family) now include all these blocks making it a highly functional mobile SoC product. NVIDIA evolved from a maker of standalone graphics chips by adding an applications core (via ARM license) and a connectivity block (via Icera acquisition). Nvidia now offers highly integrated mobile SoCs (Tegra family) which power multiple tablet computers. Apple, which was not even in the mobile chip design business until a few years ago, started designing its own SoC based chips (A- family) using an application processor (via ARM license) and a graphics processor (via license from Imagination Technologies). An indicator of the growing influence of the SoC is the consolidation trend within the industry. Apple acquired PA Semi, enabling it to design its own application processors. Qualcomm acquired Atheros to strengthen its wireless connectivity suite and Summit Technology for enhanced power management capability. NVIDIA acquired Icera to strengthen its connectivity offering and Intel acquired Infineon Wireless to gain entry into the baseband connectivity market. These acquisitions point to a consolidating market in which only a few strong players have all the required functional blocks and are getting ready to fiercely compete in the growing mobile market. The smartphone offered the first significant platform for SoC technology to demonstrate its potential and put the SoC on a collision course with the standalone CPU. The smartphone valued on-chip integration far more than a standalone desktop. Utilizing dedicated functional blocks has several advantages over general purpose processing cores — these blocks can operate at lower frequencies while delivering higher system-level performance and consuming much lower system-level power. By moving more functionality to hardware, the SoC enables lean software which results in lower system-level power. Using dedicated cores enables the smartphone SoC to only turn on specific blocks for specific tasks whereas a general purpose CPU would have to be on all the time regardless of the task being performed. An SoC is thus far better suited for mobile devices compared to a standalone CPU. Early leadership in SoC technology put the foundry ecosystem players at a significant advantage over incumbents like Intel and the technology also benefited immensely from rapid growth in smartphone shipments. Intel was unable to break into the smartphone market for the first five years (until 2012). The introduction of the iPad and the subsequent growth in the tablet market further solidified this trend. An indicator of the disruptive potential of the SoC is the rapid rate of advancement — not only in terms of functionality and shipped volumes but also the proliferation of a robust design and software ecosystem to support it. In just five years, SoC technology has catapulted from enabling basic computation/connectivity on a feature phone to being at the heart of all smartphones, tablets and Chromebooks, capable of a wide range of functions including audio/video, gaming, communication and productivity. The unique cost structure enabled by the SoC has the potential to truly disrupt the business model in the semiconductor industry. The ASP for an SoC chip (NVIDIA Tegra or Qualcomm Snapdragon) is in the range of $10-20 while the ASP for a leading edge Intel CPU chip (Skylake) is in the $150 range. The CPU chip will also need to be supported by other chips (e.g. power management) to provide all the functionality that is provided by a single SoC. When OEMs compete on price, it will be very difficult for the CPU product to compete while retaining historically high profit margins. As the SoC gets better and encroaches into the laptop space (e.g. NVIDIA SoC powers the ChromeBook Pixel C), the cost differential will have an even larger impact. The rising influence of a low-cost, low-end technology (SoC) and its potential to eat into the profit margins of a sustaining high-cost, high-end technology (CPU) is an example of the classic disruption theory articulated by Clayton Christensen (Link). The Apple A9X SoC and the Intel Skylake CPU are both best-in-class products — but they are designed for different form factors and cost and value metrics. While it is conceivable that the low-margin SoC may be able to serve the high-end laptop market well, it seems unlikely that the high-margin CPU will be able to serve the low-end mobile market as well. Today’s high-end iPad Pro powered by ARM based A9X SoC performs very comparably to (by some metrics, even better than) the Surface Pro4 powered by an Intel x86 CPU processor. Intel has a significant lead in CPU process technology and is at the forefront of Moore’s Law. However, radical changes to architecture (e.g. 14nm FinFET) may slow down the integration of on-chip functionality. As an example, in spite of acquiring baseband technology from Infineon in 2011, Intel has yet (in 2015) to integrate it with in-house 14nm technology. Intel’s SoC product offering has traditionally lagged its mainstream CPU offering by 1–2 years. That gap is expected to narrow in the coming years as Intel addresses the growing need for on-chip integration and the growing threat from seemingly low-end product offerings which are rapidly becoming more competitive and cost-effective in the high-end. The present decade represents a period of strategic inflection in the evolution of the semiconductor industry — the next five years are likely to see a confluence of several technology and market forces which will collectively have a profound impact on the course of the industry. These trajectories are discussed below. Mobile SoC (Android and iOS) shipments already dwarf CPU shipments by 5:1 (See Benedict Evans Link). The direct result of this trend will be the increasing importance of the mobile SoC in shaping the foundry transistor technology roadmap. It is important to note that the transistor design points for a CPU are far more restrictive than those for an SoC. Historically, the CPU (and hence, Intel) has been the driving technology that influenced transistor development. Going forward, the SoC is likely to take on that role. This in turn will significantly challenge the dominance of Intel/x86 architecture as most mobile SoCs are designed with ARM architecture. Functional integration is expected to continue making the SoC far more sophisticated and powerful. It will also evolve to consume less power as it moves to advanced geometries. Apple has demonstrated solid performance gains over successive iterations of their flagship SoC (Ax). There is likely to be fierce competition among lower tier design houses (Qualcomm, NVIDIA, MediaTek) as each tries to incorporate more functionality into their chips and win designs for new mobile products. The ascendance of the SoC will thus force disruptive changes to the traditional IDM cost structure and business model. Usage models of the tablet and the smartphone indicate that the GPU is the most heavily used block within SoCs like the Tegra, Snapdragon and the A8X. Since the GPU is the largest block and also consumes most of the power on the chip, it is instructive that the silicon transistor be designed to optimize the performance and power of the GPU. It is likely that design houses and foundries will make the GPU the centerpiece for transistor design and manufacturing — historically all the blocks including the GPU had to adapt a transistor that had primarily been designed for the CPU. The rapid evolution of the SoC and the increasing role of the GPU are evident in successive generations of Apple A*x family processors. The GPU on the A8X processor occupies almost a third of the die area. 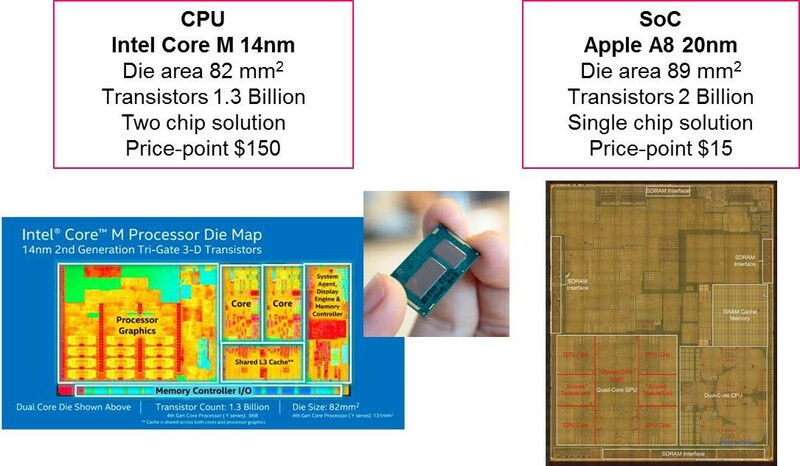 Die photos of Apple A5X, A6X and A8X SoCs — The GPU occupies a substantial portion of the die (30–40%). Similar trends can be observed in the Snapdragon (QCOM) and Tegra (NVDA) family of processors (Source: Chipworks). Tablet and smartphone offerings are refreshed once every year — much faster than the historical PC refresh cycle. The semiconductor industry will need to adjust its technology development lifecycle to keep pace with the mobile product lifecycle. It is not feasible to scale-down transistor geometry every year beyond the 14nm node — however it is quite feasible to rapidly incorporate increasing levels of functional integration into an existing geometry. As the law of diminishing returns eventually catches up with Moore’s Law, there will be little economic incentive to scale transistor feature size. Companies at the leading edge of Moore’s Law may be able to compete effectively in high margin segments (servers and data centers) but will find it difficult to price their parts competitively for the low margin consumer markets. These vectors are likely to put SoC technology at the heart of the semiconductor industry. The modular, lego-like integration of SoC enables even relative newcomers to quickly put together competitive chip offerings — increasingly, fabless design houses like Qualcomm will face tremendous pricing pressure from low-cost design houses (e.g. MediaTek, RockChip, AllWinner). Design IP providers like ARM and Imagination Technologies are poised to benefit immensely as well. Foundries are well positioned to capitalize on this trend and will benefit from refocusing their efforts on transistor design in a way that is GPU-centric rather than being CPU-centric. Intel will continue to face increasing competition in the mobile market and Intel’s product mix may reflect a move toward more on-chip functional integration in the years to come. More importantly, Intel will be forced to also compete with SoC technology in the laptop and PC segments and doing so may necessitate a change not only in its technology direction but also in its business model. If these trends continue, there is no reason why a highly integrated SoC chip cannot displace a standalone CPU chip in a premium laptop (e.g. MacBook Air or MacBook Pro). The boundaries between the standalone CPU and the SoC are thus likely to erode in the years to come as the industry embraces and unleashes the full disruptive potential of the SoC. If you liked this essay, please click recommend below or share it so that others may find it too.